Rainwater replaced water from leaking pipes after city workers dug up an eastside sidewalk and left it unfinished for months. 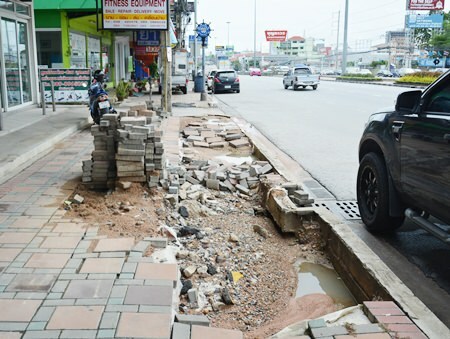 Residents near the worksite on Sukhumvit Soi 41/2 have complained to city hall about the long delay in repaving the mud-filled and debris-strewn sidewalk. Daeng, a local resident, said he last saw Water Department workers at the site two months ago. They spent a day digging up the bricks and repaired the pipes, but never bothered to lay new bricks. City workers dug up an eastside sidewalk to repair leaking pipes, then left it unfinished for months. “Are the residents supposed to clean up this mess?” he asked incredulously. 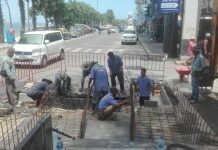 Alerted to the workers’ negligence, city hall promised to fix the problem, but said that although the pipes no longer are leaking, rain had made the surface unsuitable for resurfacing, so they’ll have to wait for it to dry out first.